A celebration of the life of Marvin Gaye and his great music : his biography, discography, lyrics, concerts and pictures. Enjoy the treasures in the legacy of the king of rnb and soul ! Gaye was born in Washington, D.C. as Marvin Pentz Gay, Jr., but later added the "e" due to childhood teasing and to appear more professional (akin to his childhood idol Sam Cooke's addition of an "e"). His father , Reverend Marvin Gay, Sr., was an ordained minister in the House of God, a small, conservative sect spun off from the Seventh-day Adventist Church. The church, borrowing some elements of Pentecostalism and Orthodox Judaism, has very strict codes of conduct and does not celebrate any holidays. Gaye got his start singing in the church choir and later learned to play the piano and drums to escape from his physically abusive father (see David Ritz' biography Divided Soul: The Life of Marvin Gaye). After high school, Gaye joined the United States Air Force and then, after being discharged, joined several doo wop groups, settling on The Marquees, a popular D.C. group. With Bo Diddley, The Marquees released a single, "Wyatt Earp", in 1958 on Okeh Records and were then recruited by Harvey Fuqua to become The Moonglows. "Mama Loocie", released in 1959 on Chess Records, was Gaye's first single with the Moonglows. After a concert in Detroit, Michigan, Gaye was recruited for a solo career by Berry Gordy, Jr. of Motown Records. As a session drummer and part-time songwriter, Gaye worked with The Miracles, The Contours, Martha & the Vandellas, and other Motown acts. Most notably, he is the drummer on The Marvelettes' 1961 number one hit "Please Mr. Postman" and Little Stevie Wonder's 1963 number one hit "Fingertips Pt. 2" and co-wrote Martha & the Vandellas' 1964 hit "Dancing In The Street" and The Marvelettes' 1962 hit "Beechwood 4-5789". Popular and well-liked around Motown, Gaye already carried himself in a sophisticated, gentlemanly manner and had little need of training from Motown's in-house Artist Development director Miss Maxine Powell. Not only part of the Motown family, he also became part of the Gordy family when he married Berry Gordy sister Anna in 1964 after a three-year courtship. Marvin Gaye's first three Motown singles were all unsuccessful; he finally scored a minor hit in 1962 with his fourth attempt, "Stubborn Kind of Fellow", with Martha & The Vandellas on background vocals. The single was co-written by Gaye and William "Mickey" Stevenson, who created the title as a sly reference to the sometimes moody Gaye. 1963's "Hitch Hike" and "Can I Get a Witness " were also minor hits. These earlier records featured a "churchiness�that was pushed by that urgent Detroit rhythm section". "Pride & Joy " (1963) became a smash hit, but Gaye was discontented with the role he felt Motown Records kept him locked in: a romantic balladeer and crooner, aiming always for chart success in the singles market. He wanted instead to be a pop singer in the vein of Nat King Cole or Frank Sinatra but settled for a blend of the styles of those artists with the passionate soul singing of performers such as Jackie Wilson and his role model Sam Cooke. A number of Gaye's hit singles for Motown were duets with female artists such as Mary Wells, Kim Weston and Tammi Terrell; the first Gaye/Wells album, 1964's Together, was Gaye's first charting album. Terrell and Gaye in particular had a good rapport, and their first album together, 1967's United, birthed the massive hits "Ain't No Mountain High Enough" and "Your Precious Love ". Real life couple Nickolas Ashford and Valerie Simpson provided the writing and production for the Gaye/Terrell records; while Gaye and Terrell themselves were not lovers, they convincingly portrayed lovers on record, indeed Gaye sometimes claimed that for the durations of the songs he was in love with her. On October 14, 1967, Terrell collapsed into Gaye's arms onstage while they were performing at the Hampton University homecoming in Virginia (contrary to popular belief, it was not Hampden-Sydney College, also in Virginia). She was later diagnosed with a brain tumor, and her health continued to deteriorate. 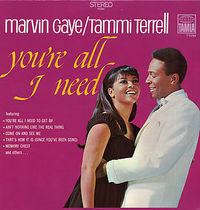 Motown decided to try and carry on with the Gaye/Terrell recordings, issuing the You're All I Need album in 1968, which featured the hits "Ain't Nothing Like the Real Thing" and "You're All I Need to Get By ". By the time of the final Gaye/Terrell album, Easy, in 1969, Terrell's vocals were performed mostly by Valerie Simpson. Two tracks on Easy were archived Terrell solo songs with Gaye's vocals overdubbed onto them. Terrell's illness began a depression in Gaye; when his Norman Whitfield-produced "I Heard It Through the Grapevine " became his first #1 hit and the biggest selling single in Motown history to that point, he refused to acknowledge his success, feeling that it was undeserved. Meanwhile, Gaye's marriage was crumbling with Anna and he continued to feel irrelevant, singing endlessly about love while popular music underwent a revolution and began addressing social and political issues. Tammi Terrell died of brain cancer on March 16, 1970. Gaye subsequently went into self-seclusion, and did not perform in concert for nearly two years. He tried various spirit-lifting diversions, including a short-lived attempt at a football career with the Detroit Lions, but continued to feel pain with no form of self-expression. As a result, he entered the studio on June 1, 1970 and recorded the songs "What's Going On ", "God is Love", and "Sad Tomorrows" - an early version of "Flying High (In the Friendly Sky)". 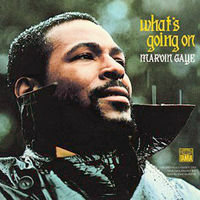 Gaye wanted to release "What's Going On ". Motown head Berry Gordy refused, however, calling the single "uncommercial". Gaye refused to record any more until Gordy gave in, and the song became a surprise hit in January of 1971. Gordy subsequently requested an entire album of similar tracks from Gaye. The What's Going On album became one of the highlights of Gaye's career, and is today his best known work. Both in terms of sound (influenced by Funk and Jazz) and lyrical content (heavily political) it was a major departure from his earlier Motown work. Two more of its singles, "Mercy Mercy Me (The Ecology)"
and "Inner City Blues (Make Me Wanna Holler) " became Top 10 pop hits and #1 R&B hits. The album became one of the most memorable soul albums of all time, and, based upon its themes, the concept album became the next new frontier for soul music. It has been called "the most important and passionate record to come out of soul music, delivered by one of its finest voices." 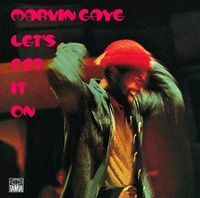 1973's Let's Get It On LP is among Marvin Gaye's most noted works. 1973's Let's Get It On was a sexually and romantically charged album that was very successful on the charts and remains "a record unparallelled in its sheer sensuality and carnal energy." Gaye teamed up with Diana Ross for Diana & Marvin, an album of duets that began recording in 1971, while Ross was pregnant with her first child, Rhonda. Gaye, a longtime marijuana smoker, refused to put his joints out for the pregnant Ross, who immediately complained to Berry Gordy about the issue. Gaye refused to sing if he couldn't smoke in the studio, and the duets album was recorded by overdubbing Ross and Gaye at separate studio session dates. Gaye released "I Want You" and the album of the same name by himself as his marriage finally ended in 1975. In between the controversy surrounding him, Gaye released the seminal funk/disco single, "Got to Give It Up ", which went to No. 1 on both the pop and R&B charts in 1977. As part of a divorce settlement with Anna, Gaye agreed to record a new album and remit a portion of the royalties to Anna as alimony. The result was 1978's Here, My Dear, a deeply personal album that so clearly detailed the sour points of Gaye's former marriage that Anna Gordy considered suing him for invading her privacy. After a failed single and a rapidly failing new marriage to Janis Gaye, Gaye moved to Hawaii. 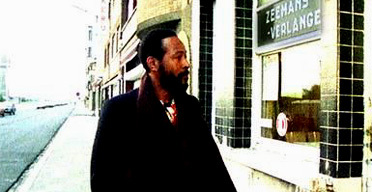 Tax problems and drug addictions haunted him, and after failing to get Motown labelmate Smokey Robinson to loan him money to take care of the tax issues, Gaye was forced to move to Ostend, Belgium in 1981. In Ostend, he worked on his biography along with David Ritz, and started laboring on In Our Lifetime?, a complex and deeply personal record. When Motown issued the album in 1981, Gaye was livid: he accused Motown of editing and remixing the album without his consent, releasing an unfinished song, ("Far Cry") altering the album art he requested and removing the question mark from the title (rendering the intended irony imperceptible). He negotiated a release from the label and signed with Columbia Records in 1982 and released Midnight Love the same year. Midnight Love included "Sexual Healing " , one of Gaye's most famous songs, and his final big hit. The hit finally gave Gaye the respect he deserved as he won two Grammy Awards for the song (Best R&B Male Vocal Performance and Best R&B Instrumental) in February 1983. Around the same time Gaye gave an emotional performance of the Star-Spangled Banner at the NBA All-Star Game, held in the L.A. Forum. Gaye's refound fame pushed him even deeper into drug addiction and paranoia as he had had a premonition that someone was going to kill him. Throughout his tour, he had a bevy of bodyguards surrounding him to keep him safe and often wore a bullet-proof vest. By the time the tour ended, he attempted to isolate himself by moving into his parents' house. 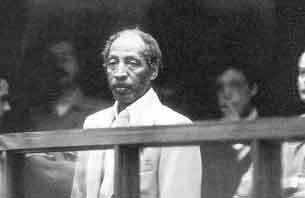 He threatened to commit suicide several times after numerous bitter arguments with his father , Marvin, Sr.
On April 1, 1984, one day before his forty-fifth birthday, Gaye's father shot and killed him after an argument. Some of Gaye's relatives claimed that he had purposely pushed his father to the edge so that he could have Marvin, Sr.kill him instead of having to commit suicide. Gaye left behind three children - son Marvin Pentz Gaye III (b. 1965), daughter Nona Marvisa (b. 1974), and son Frankie Christian (b. 1975). After some posthumous releases cemented his memory in the popular consciousness, Gaye was inducted into the Rock and Roll Hall of Fame in 1987. 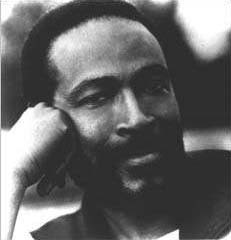 Marvin Gaye, Sr. ., died of pneumonia in 1998. Wikipedia information about Marvin Gaye. This article is licensed under the GNU Free Documentation License. It uses material from the Wikipedia article "Marvin Gaye".